Iâ€™m back with another Plan With Me post and video! 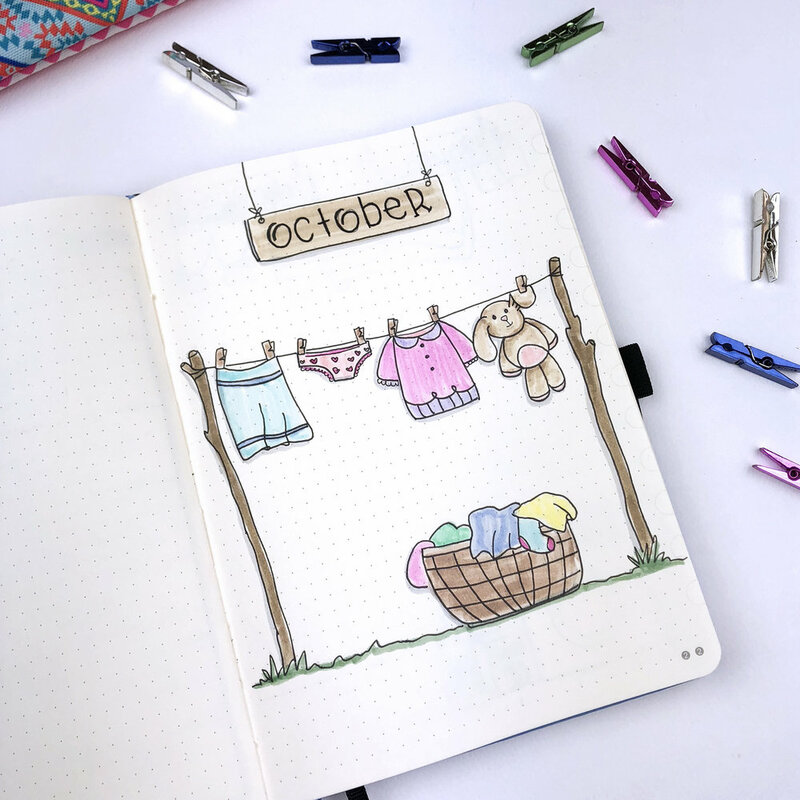 Setting up my bullet journal early each month helps me to plan the next month on time and to thoroughly go through my tasks and projects in order to see what needs to be done. The first page is as always my Cover Page. I wanted it to be fun and cute. I created a laundry line with some clothes hanging and a laundry basket. And I also added a little bunny that needed some cleaning. I always clean my kidsâ€™ toys and this particular one reminded me of my daughter and her little teddy bears. As always I chose mostly pastel colours. You can see all the supplies that Iâ€™ve used at the end of this post. The next page is my Month at a Glance page. I really liked the way I did it for September, and Iâ€™ve realised that the one-page layout works better for me. So, I went ahead and created a similar page for October. Also, because the Dingbats notebook is a bit bigger than my previous ones (28 squares horizontally and 39 squares vertically), I could make the table a bit bigger - which is a bonus! And I added more laundry at the top, in order to continue with the theme. On the opposite page I added my Monthly Goals, which I like to separate in â€˜Personalâ€™ and â€˜Businessâ€™. After I tried the vertical layout of the categories in September, I saw that I prefer it this way and therefore I did the same for October. I also added some light blue lines to fill the page and some doodles at the bottom to tie it with the theme. Moving on, I made a few changes with the rest of my pages this month. I decided not to create my â€˜Financesâ€™ page and my â€˜Areas of Focusâ€™ page. I am trying something different to track my finances, so that page wasnâ€™t needed. 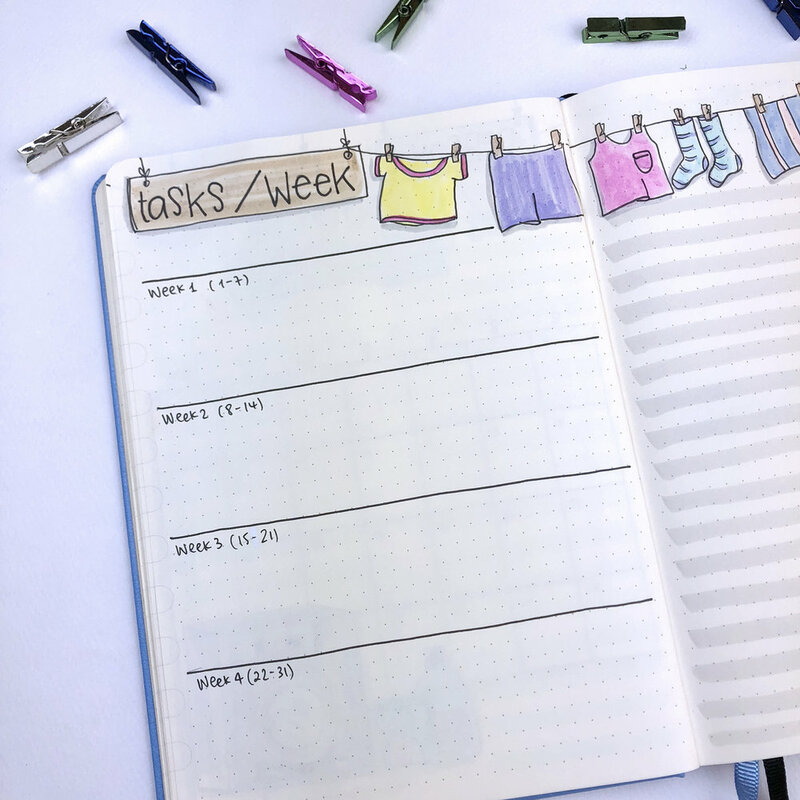 And for the other page, I am just testing if itâ€™s better to not include it in my monthly setup and to add everything straight into my â€˜Tasks / Weekâ€™ page. As Iâ€™ve mentioned before, this is what I love about bullet journaling; the flexibility to try different things to see if they work and then choose the best layout for you. So, Iâ€™ve decided to combine my â€˜Tasks / Weekâ€™ page with my â€˜Notesâ€™ page. That way, if I need extra space to write my tasks or to be more analytical with the steps I need to take, then I can use part of the Notes page. 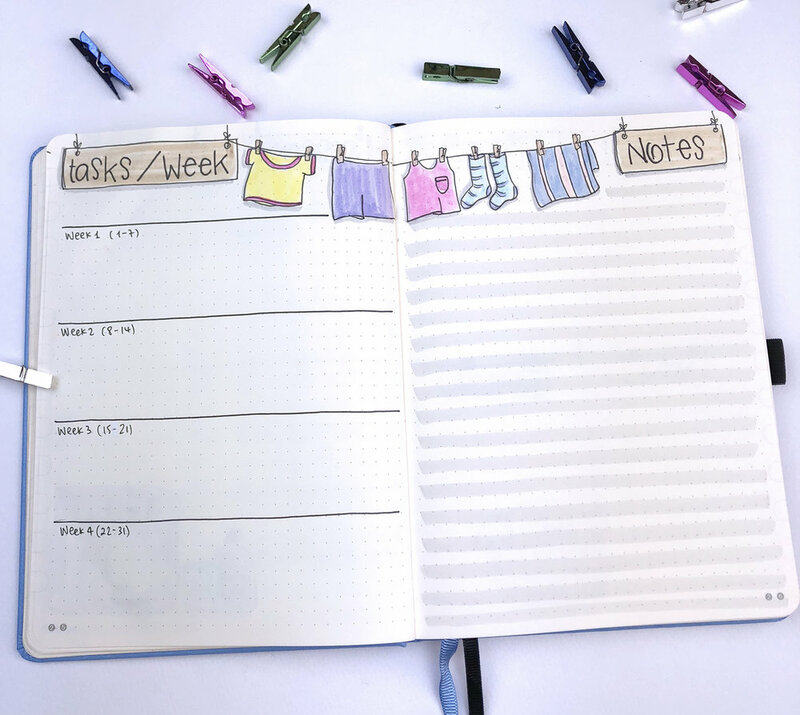 I created a joined laundry line, to show that the pages are joined, and Iâ€™ve added light grey lines for the Notes page. Next, comes the first weekly spread of the Month. I chose to use again a dutch door layout, because I loved using it last month. I used the laundry theme to decorate the boxes and I added some more elements throughout the spread. I also made some changes on the middle page. On the front part Iâ€™ve added 2 sections for my meals and my shopping (instead of my tracker), and I kept the back part the same with note sections for this and next week. I really like the functionality of this page as well as the way it looks.